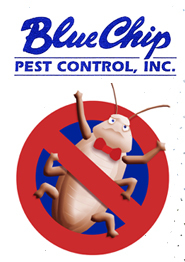 Welcome to Blue Chip Pest Control, Inc.
At Blue Chip Pest Control, Inc., we understand that pests need to be taken care of promptly. For more than 20 years we have been the pest control company of choice for residential and commercial clients in Orange and Los Angles Counties. Our technicians have a combined 50 years of professional experience to assure protection and elimination of all types of destructive pests. Additionally, we're experts at the proper, proven methods of selecting and applying pest control chemicals.